At least 2 factors are considered when pricing any work done by me. First how large is the item - the larger the item, the more space in the freeze drying chamber it occupies and usually the more time to freeze dry correctly. Second is how difficult will the item be to paint back to its natural colors. 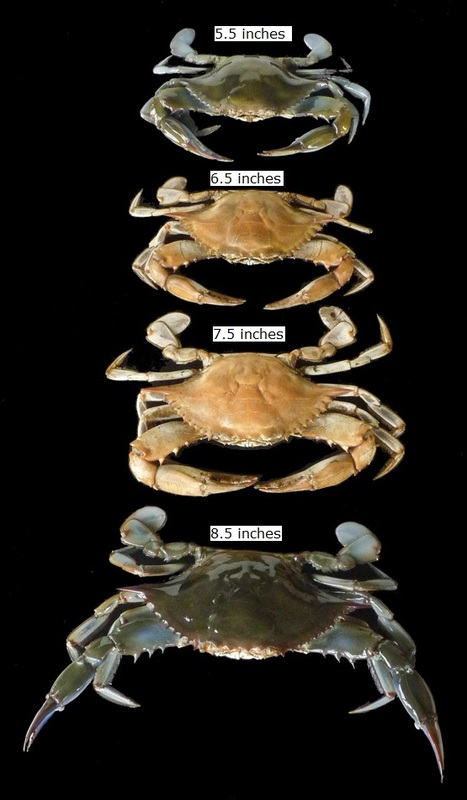 While describing how difficult a item is to paint back to natural colors is hard to explain, size is simple and here is a pic of different size male crabs measured from tip to tip across carapace(back) I used for illustration. Note the brown/orange crabs are freeze dried and not yet painted. I have 2 freeze drying units. Space is limited and that is why size is the most important factor in pricing. My freeze dried blue crab specimens are one of the most sought after blue crab artworks and gifts. The musuem quality blue crab gifts are guaranteed to please and warranted for 20 years. Your blue crab sent to me to preserve and paint will be warranted for 20 years, too. Allow me to make a beautiful, cool, and unique blue crab gift for you or your blue crab lover.